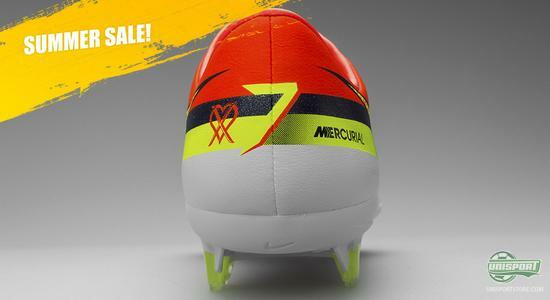 Starting today and until Sunday, we will put special focus on one of our very top summer offers, and today we will take a closer look at the super cool Nike Mercurial Vapor IX CR7. So, if you are looking for nice boot with super star associations for the upcoming season, then this is the place to be. We would all love to be as good as Cristiano Ronaldo or have just a fifth of his talent and be able to accelerate, strike, and dribble with same elegance, speed and power. 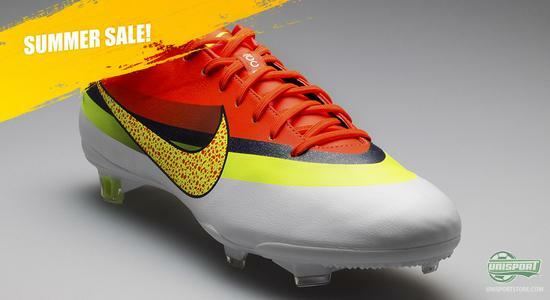 We will, although, have to admit that it is extremely hard to reach his sublime level , and therefore we will have to make do with getting really close to the Portuguese superstar's cool football boot, the Nike Mercurial Vapor IX CR7, so come along as we put a special focus on one of our top summer offers. But even though you do not have Ronaldo's football skills, it is definitely also an experience to look at, and also to play in this fifth edition of the Cristiano Ronaldo signature boots. The boot has some fresh, light and elegant summer colours, that suit the summertime perfect and are ready to kick off the coming season and help you prove to your coach that you have not lost your qualities over the summer. 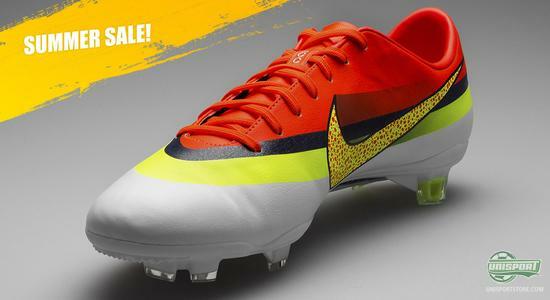 Are you looking to get your hands on the Nike Mercurial Vapor IX ACC CR7, then click right here. 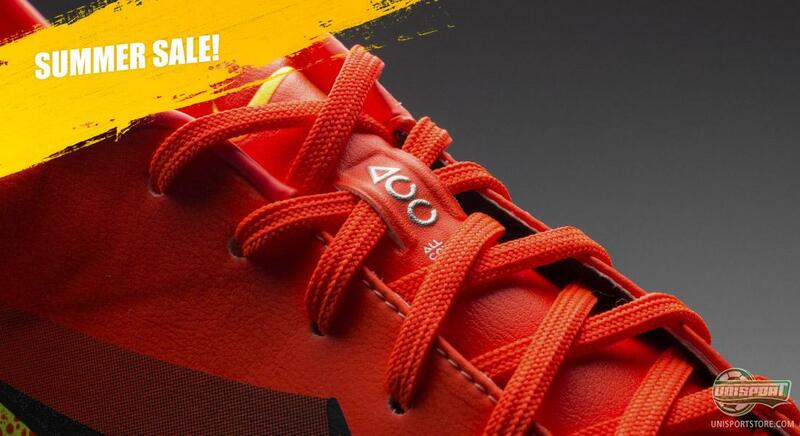 - you will get 40% off on this unique boot right now. And even though it can be hard to move on from the nice and unique Cristiano Ronaldo design with the sharp colour combinations, we will now do just that, and move on to look at the specs of this elegant boot. The upper is made by the Japanese specialists from Teijin, who deliver a soft and supple upper with a leather finish for Ronaldo's boot; exactly like Ronaldo's previous signature colourway, the Vapor VIII ACC CR. In addition, the upper is equipped with Nike's All Conditions Control technology (ACC), which ensures the same grip in wet conditions as you would have in the dry. 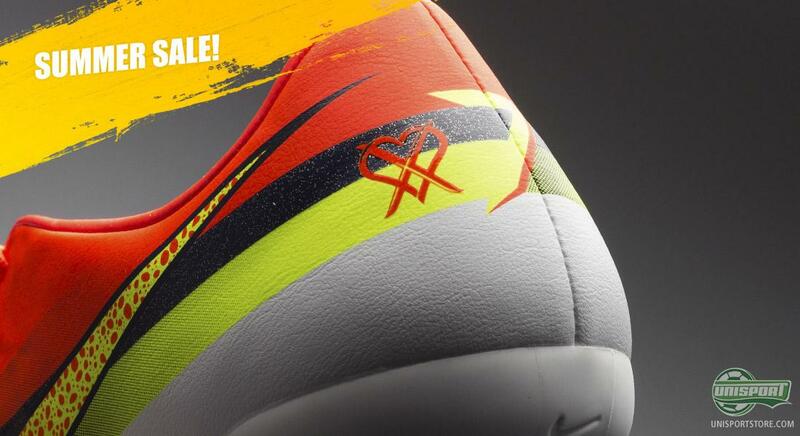 On the heel you find Cristiano Ronaldo's Love to win, hate to lose logo, which represents the superstar's personality both on and off the pitch. It features a heart and a cross, which are overlapping; the heart represents both the love to be victorious and the love for the game, whereas the cross represents the hate to lose. And if Crstiano Ronaldo is in a duel with his direct opponent, there can be no doubt, he would hate to lose. In fact you could imagine the cross on the heel turning flaming red with anger, should a defender have the cunningness to prize the ball from him. This should however hardly ever happen, especially because this boot is in the lightest end of the scale, when it comes to weight. It weighs just 185 grams, which gives Ronaldo a natural advantage. Will you be getting your hands on the Nike Mercurial Vapor IX ACC CR7, just click here. - Right now you save a whopping 40%! 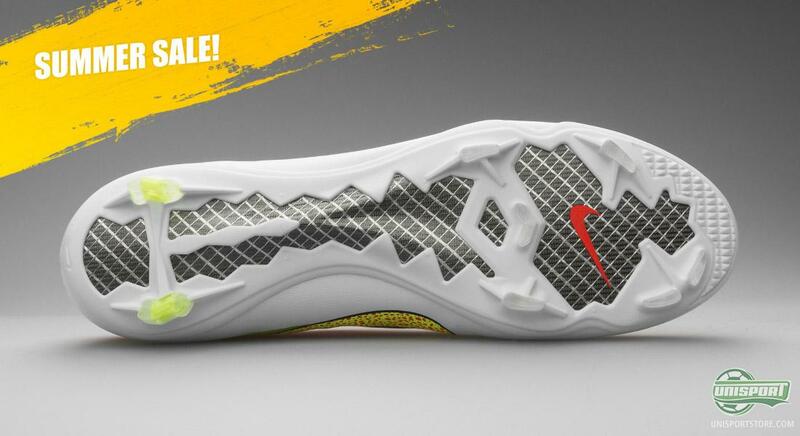 Another design element, which really separates this boot from the regular Vapor IX-models is that on the this boot there has been made room on both sides for the Nike-swoosh, which you also saw on the Vapor VIII ACC CR7-model. It bares resemblance to some of the first Mercurial-models, which you definitely can't complain about, particularly because it is the boot's 15th anniversary. 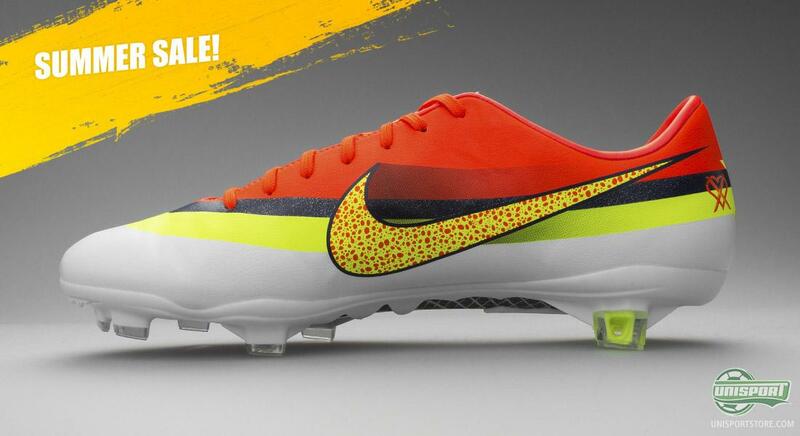 If you want speed on your feet  something this boot screams out  then you need a stud-configuration, which allows just this. Nike have considered this and designed a system with bladed studs and a single V-shaped stud in the middle, so the boot has immense grip and an explosive kick-off. Something Ronaldo utilises often, when he charges at retreating defenders. With this Cristiano Ronaldo signature boot, you get a boot, which not only looks summery and fresh, but is also optimised to give an optimal touch on the ball, a unique grip in the pitch. The explosive nature of the boot means that you get a boot, which will let you get as close to Cristiano Ronaldo and his football magic. Will you be getting your hands on the Nike Mercurial Vapor IX ACC CR7, then you can click right here. You can also have a look at some of our many other summer offers right here. This Nike Mercurial Vapor IX ACC CR7 is an extremely cool boot, which is born to attract attention both on and off the pitch. 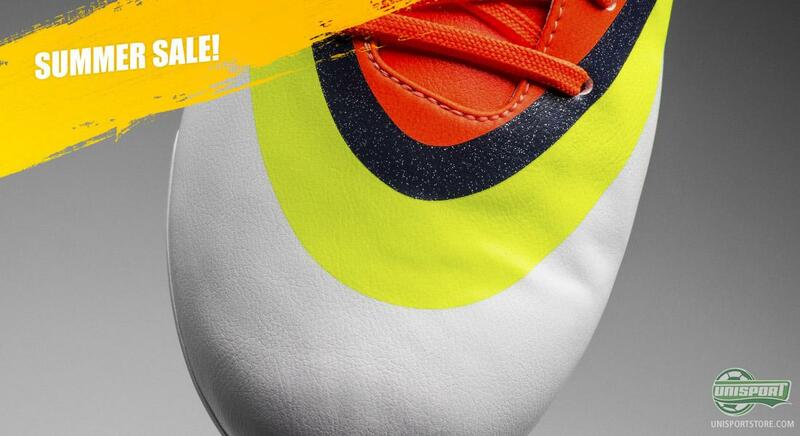 Would you like to face the summer and new season in the CR7 Vapor? And can Cristiano lead Real Madrid to the Spanish Championship this season? As always we would love to hear from you here, on Facebook and Twitter.